Today I’m feeling a little homesick for the midwest. Even though I haven’t lived there in 18 years, I still miss their gorgeous spring/ summer weather. Adding to my gloom is the fact it’s my nephew’s last day of school today- which means his summer starts tomorrow. Meanwhile, here in the cold and rainy Northwest, we still have a full month of school left. ARGH! Can you blame me for being depressed? 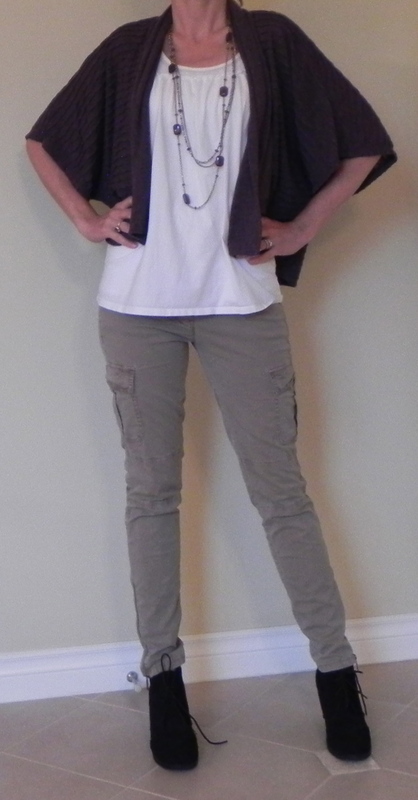 Anyhoo… my outfit today is based on my cargos. (By the way, I keep the pair on the right in my closet purely for comparison). The loose baggy fit makes them really comfy pants, but they are not flattering at all! To improve the look I have swapped them out for my skinny cargos. I’ve also switched out the plain boring shoes for these booties. Now, most people in the country are probably wearing sandals today. BUT, if you live in a climate like mine- it’s too darn cold for sandals- hence the booties (with socks)! I have paired my cargos with a white tank and a purple open cardigan. 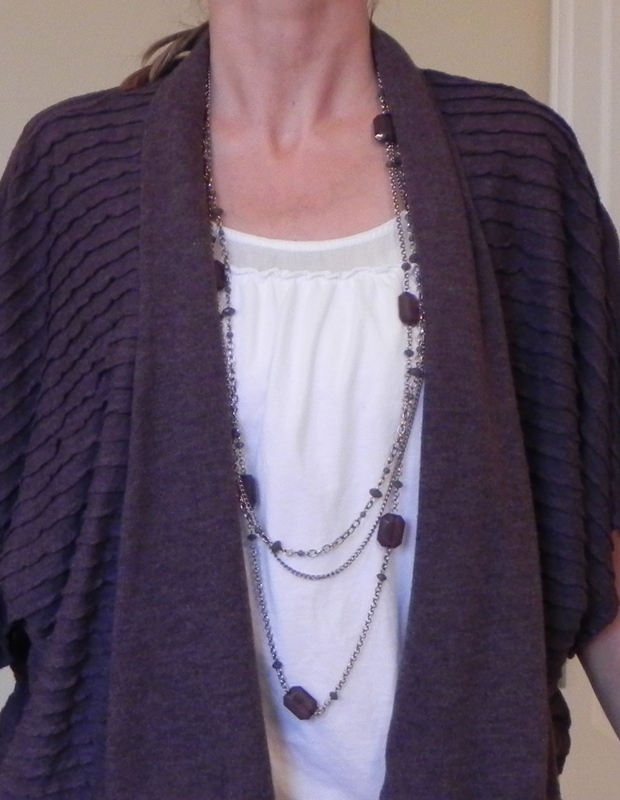 I’m showing a close up below so you can really see the color and the texture of this sweater. It’s pretty cool. Also, it’s a small detail, but on the right I have on a plain tank, and on the left I’ve switched it up for a tank with a cute little sheer panel and ruffle at the top. Small details like this make a big difference. Of course, to top it all off- I’ve added a necklace. Also, I apologize for the quality of these photos. The auto focus seems to not be working. Not sure why?! The little ruffle at the top of this tank makes it interesting. Purple and army green are a cool color combination! Big hug, hope you feel better soon! It’s so dark & dreary here today I feel it too. We need some light & blue skies!! Thanks! Yes, we definitely need some vitamin D! By the way, your blog is adorable- you are so incredibly crafty. It’s fun to see what you do! Cute outfit, I love the skinny cargos. I’m tired of being cold, too! Where, oh where is last week’s beautiful weather? I actually wore SHORTS! In B’ham!